Small tree to 15 m tall, very similar to P. albicaulis. Leaves green, 5 per fascicle, 3–7 cm long. Seed cones ovoid, 7–14 cm long, falling shortly after opening. Scales rhombic, thinner towards the tip. Seeds 10–15 mm long, wingless (Lesica 2012. Manual of Montana Vascular Plants. BRIT Press. Fort Worth, TX). Much of MT but excluding the northwestern and most eastern counties; BC and AB south to CA, AZ, and NM (Lesica 2012. Manual of Montana Vascular Plants. BRIT Press. Fort Worth, TX). Rocky slopes and ridges; montane, occasionally subalpine, rarely plains and valleys (Lesica 2012. Manual of Montana Vascular Plants. BRIT Press. Fort Worth, TX). Johnson, K. A. 2001. Pinus flexilis. In: Fire Effects Information System, [Online}. U. S. Department of Agriculture, Forest Service, Rocky Mountain Research Station, Fire Sciences Laboratory (Producer). Thilenius, J. F. 1970. 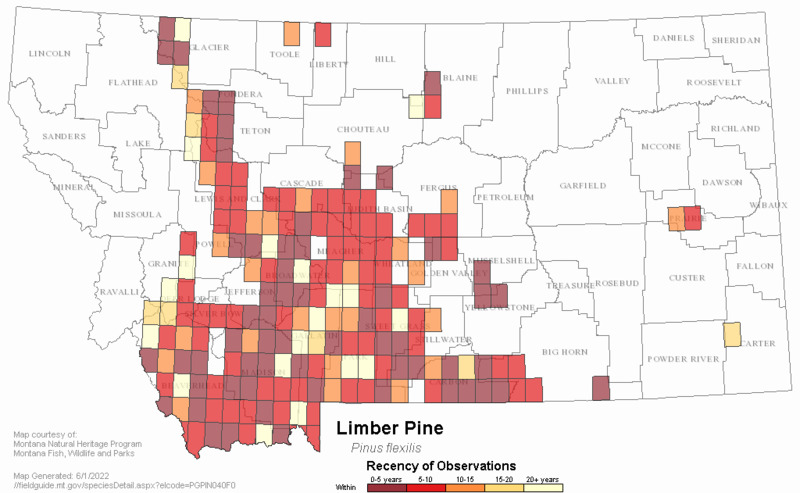 An isolated occurrence of limber pine (Pinus flexilis James) in the Black Hill of South Dakota. The American Midland Naturalist 84(2):411-417. 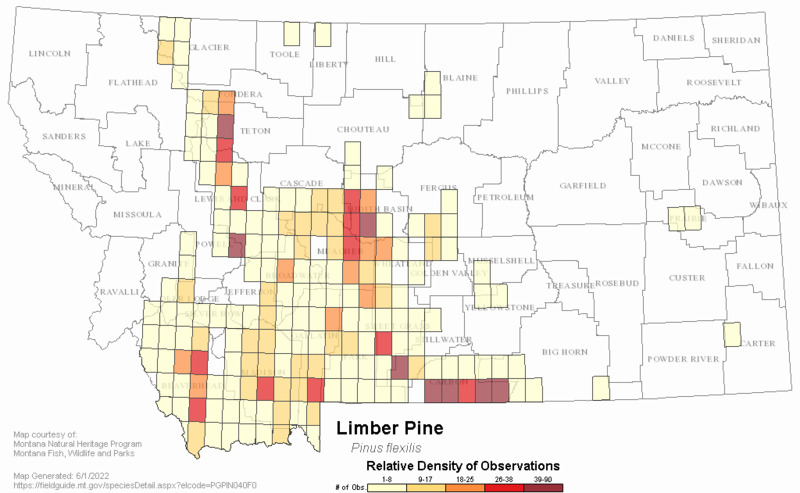 Web Search Engines for Articles on "Limber Pine"